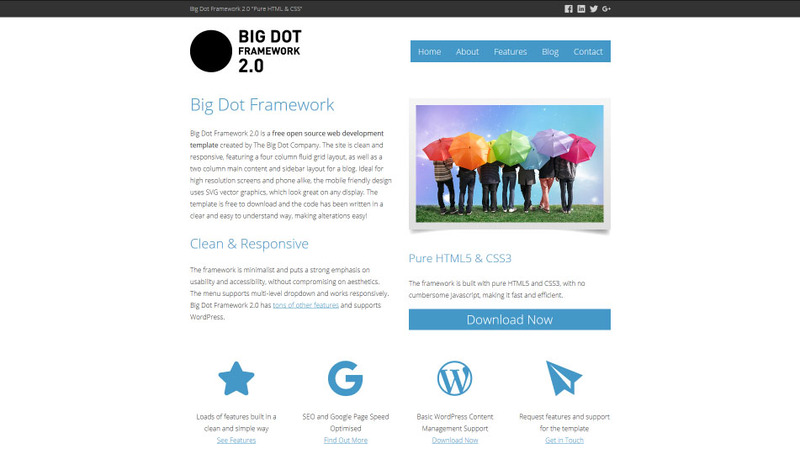 Big Dot 2.0 is a free responsive WordPress theme built on Big Dot Framework 2.0. It’s clean, mobile friendly and highly optimised. The lightweight WordPress template is packed full of features, such as an accordion, pricing table, gallery and custom map. The theme supports WooCommerce, as well as thousands of other existing WordPress plugins. You can customise the appearance of the theme from within the WordPress dashboard and pages can be built with simple shortcodes. The template is a fraction of the size of many WordPress themes, making for a lightning fast loading seed. Big Dot 2.0 is a fully open source theme, which means the possibilities for customisation are limitless, and you are free to modify and sell the theme! 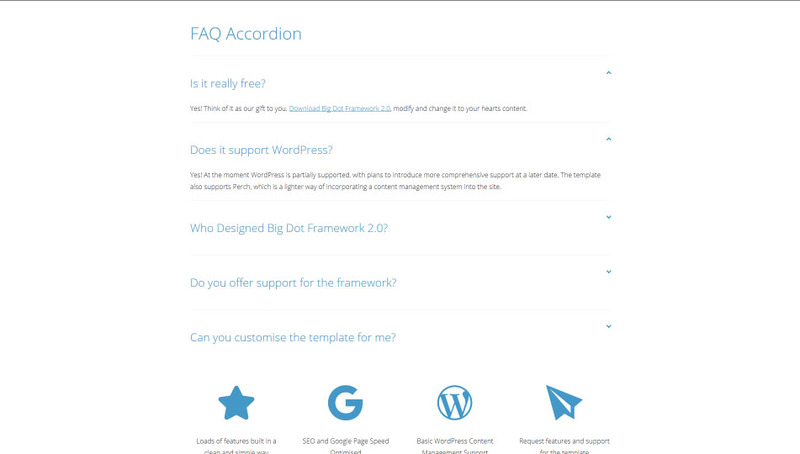 The free Big Dot 2.0 WordPress theme was built with simplicity in mind. The theme looks great on conventional desktop monitors and it will change and adapt to look just as good on tablet and mobile devices too. The theme offers full WooCommerce support, so you can have a working online shop in a matter of minutes, right out of the box. Big Dot 2.0 is built for WordPress and is compatible with thousands of existing plugins that are available for free on the WordPress repository. The Big Dot 2.0 WordPress theme has widget areas for you to add custom content and plugins to the two footer columns. It also has specific sidebars for both your blog and WooCommcerce (optional). In the WordPress admin area, you can add your site logo, tagline, change the fonts and the social links. 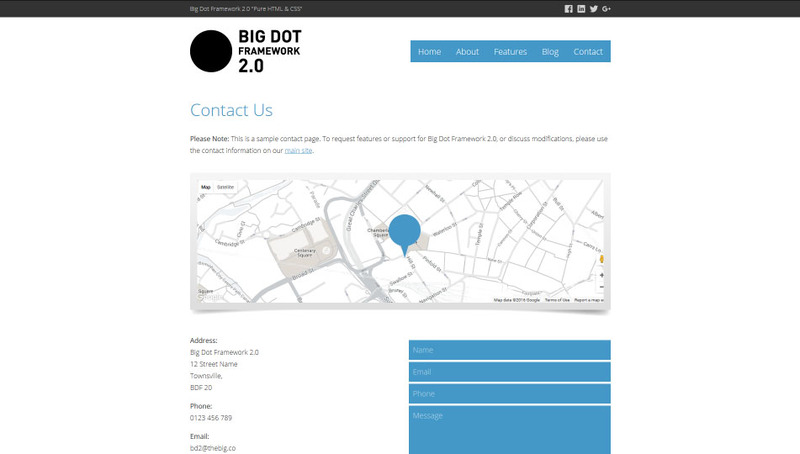 The Big Dot WordPress theme is built using Big Dot Framework 2.0, which scores 100/100 on Google PageSeed Insights, and all of the pure HTML and CSS features from the framework are available to use on WordPress too. Pages can be put together using simple shortcodes, and a number of the WordPress theme’s features, such as the buttons and accordions, can be implemented with shortcodes too. The best way to see this in action is to import the demo content that is includes with the free minimalist WordPress theme. Although Big Dot 2.0 WordPress theme is suitable for beginners, it’s open source and has enormous potential for developers to expand and change the design. The WordPress theme is completely free, so you can do whatever you like with it, even sell it! 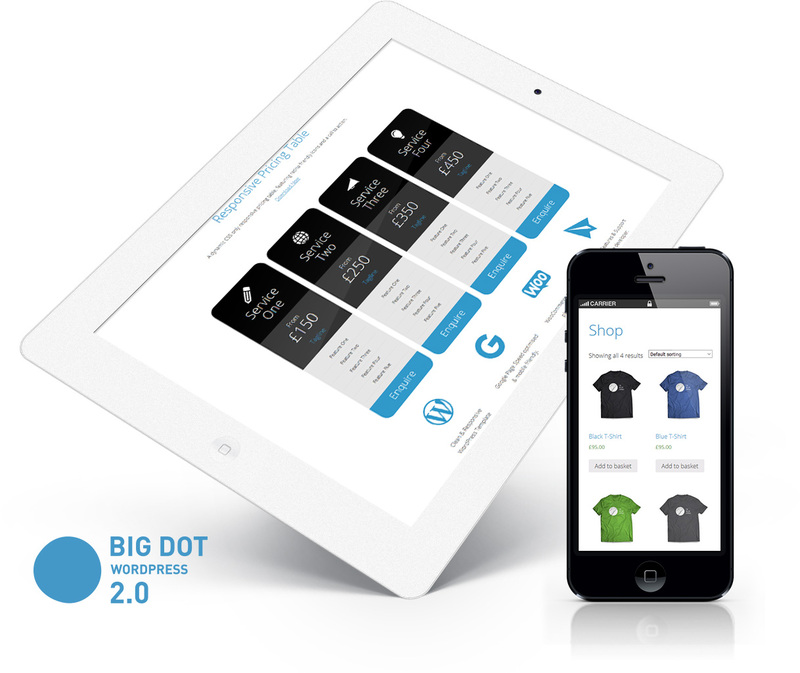 Big Dot WordPress 2.0 has been designed to be fast, user friendly and highly customisable. If you hadn’t done so already, download BD2.0 using the button below. You may also want to download the pure HTML & CSS version, as a good way to test customisation offline in a non-WordPress environment. A child themes allows you to make changes to the style.css and functions.php without them being overwritten if the theme is updated. Any other files from the main theme can be copied to here and modified too. More information on child themes. After installing the main theme, follow the same steps to install and activate the ‘big-dot-2-child.zip’ file. It’s a good idea to start by importing the demo content. 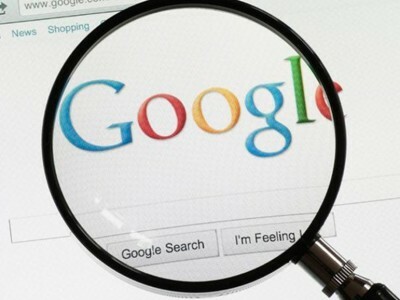 You may see some errors relating to post and product types. You can ignore these. Here you can change the name of your site. The ‘Tagline’ will appear in the top bar of each page. You can upload a new site logo by going to ‘Appearance > Customize > Site Identity’. It is recommended that you use a similar sized logo to the current one. 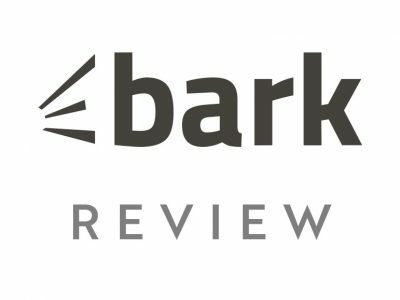 Larger/smaller logos ay require a change to the style.css file. This can be changed by going to ‘Appearance > Customize > Site Identity’ and uploading a new file (recommended size 512x512px). Advanced Tip: The html for the tagline can be changed in the header.php file. These are the four icons inside the header and footer of the site. As standard they represent Google+, Twitter, Facebook and LinkedIn. To change the URL for the icons, go to ‘Social Icons’ in the admin panel. The social icons on the contact page can be changed by editing the page’s content. Advanced Tip: The icons themselves can be changed or added to in the header.php file. 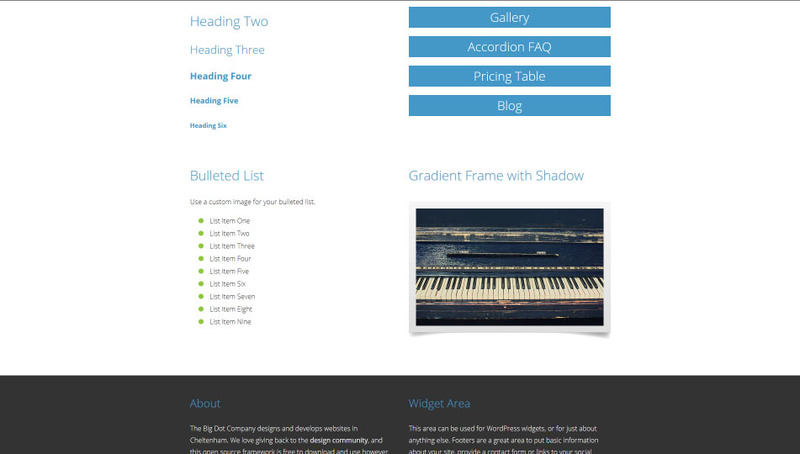 The sidebar for the blog, WooCommerce (optional) and the two footer columns can be edited under ‘Appearance > Widgets’. You can add text and a wide range of plugins to these areas. Menus can be editing under ‘Appearance > Menus’. The structure of the site and the majority of features can be built using shortcodes. You can lay out the content by enclosing it in the following shortcodes, which you can copy and paste into the visual or text editor in WordPress. A fluid left floating half width container, which becomes full width on smaller screens. A fluid left floating half width container, which becomes half and full width on smaller screens. A fluid left floating 2/3 width container, which becomes full width on small screens. Used on the blog page, but works on normal pages too. A fluid right floating 1/3 width container, which becomes full width on small screens. Used on the blog page, but works on normal pages too. Most of the design features can also be activated using shortcodes. This frame can be used to contain video embeds, or anything with a 16:9 aspect ratio. There is no shortcodes for this. 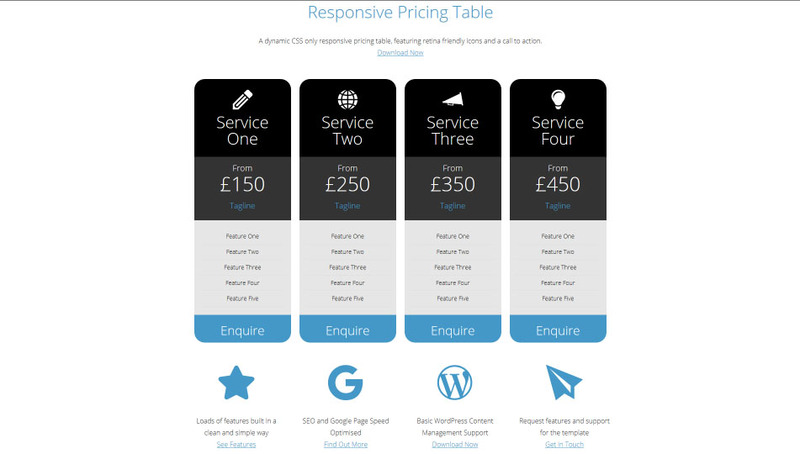 You can edit the HTML on the ‘Responsive Pricing Table’ page and edit the CSS in the style.css file. Advanced Tip: The pricing table works best if columns are used in multiples of 2. 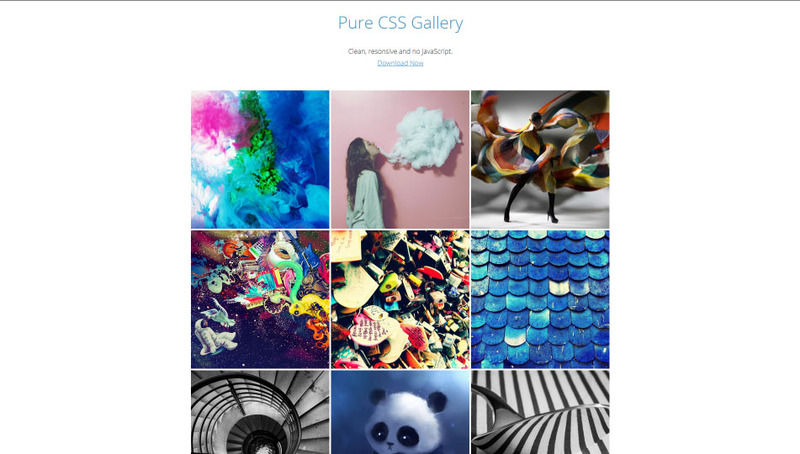 You can download the pure HTML and CSS gallery from the non-WordPress version of the theme and use that, but since we’re using WordPress, it’s easier to use an existing plugin for your gallery. We’ve used Essential Grid but there are a number of free WordPress gallery plugins you could use too. 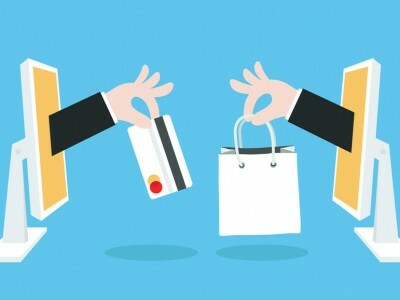 If you want a shop on your site, you can download WooCommerce for free. The sidebar is already setup under ‘Widgets’. Line 16 is the longitude and latitude of the map marker. Line 17 is the longitude and latitude of the centre of the map. You can use a site like latlong.net to find the correct long and lat for your own map. Using this link below you can restyle the map, pasting the new styles on line 25. As standard, the free Google fonts ‘Open Sans’ is used on the site. The easiest way to change this is to download the plugin Easy Google Fonts, which will then let you change any of the fonts by going to ‘Appearance > Customise > Typography’.